Do you shop online a lot, well shop online to support ROMP by registering with iGive! That’s right! 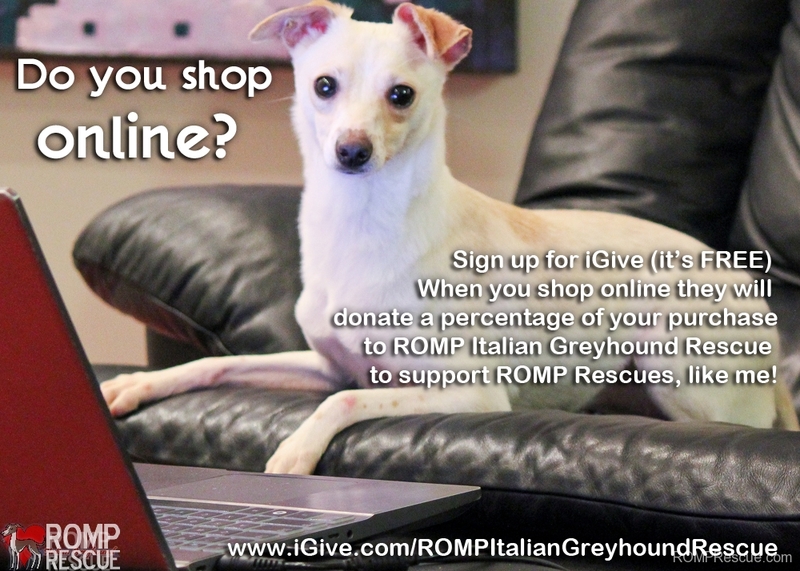 Click this iGive link: http://www.igive.com/ROMPItalianGreyhoundRescue and register your online shopping purchases to support ROMP Rescue. No hidden fees, no limits and we receive a donation check on your behalf every month for the purchases you made! Yes, you can shop AND help save a rescue dog now! Isn’t that wonderful? We think so! So, every time you make a purchase at one of over 1300 online sites listed on their site (like travelocity, overstock, amazon, and more) either through the sites links or when you have the iGive browser button installed (installing the browser button is much easier), ROMP Italian Greyhound Rescue will receive a portion of your purchase at no cost to you! 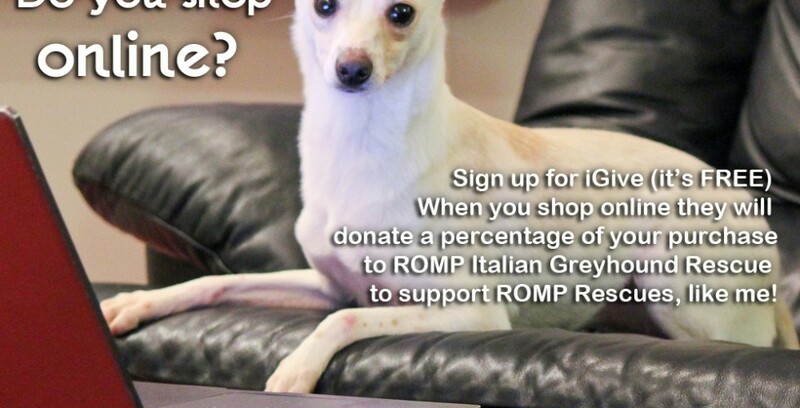 There are no pop ups, no ads, no toolbars, no special search engines, no unwanted emails, no sharing your email or personal information so help us raise more money by registering with iGive today under ROMP Italian Greyhound Rescue! It’s ALWAYS free to you – the stores pay iGive when you make a purchase and iGive cuts checks to us so we can continue our rescue efforts and save more pups! The iGive browser button is the easiest to use because you install it and go about your online business. It communicates with their servers in order to keep it’s list of applicable stores updated and when you shop at a participating store. The iGive browser button is compatible with Windows and Mac computers for Safari, Firefox, and Google’s Chrome browser. Super easy to install, just one click and you’re done! If you shop on Amazon a lot, please note: Amazon reporting is unique and unlike all others iGive stores. The only way to get a donation from Amazon purchases is to ensure you are logged into iGive.com and use an iGive site link to the store. Our favorite page to bookmark is: http://www.igive.com/amazon/ Amazon purchases will not appear in the member Shopping Report, but your cause will receive the donation. Do you have more questions? Check out their FAQ’s! Shop Online to support ROMP!!! Woof woof! Thanks! Goodsearch for ROMP Italian Greyhound Rescue Raises money for us just by searching the Internet at www.Goodsearch.com (powered by Yahoo), shopping online at www.Goodshop.com or dining at a restaurant in the www.Gooddining.com network. Login denoting ROMP as your cause of choice and use it as your main search engine to help us raise more money to save more pups! This entry was posted in ALL, News and tagged chicago, donation, fundraiser, help, iGive, illinois, italian greyhound, online fundraiser, online shopping, raise money, romp, ROMP Italian Greyhound Rescue, ROMP Rescue, Shop Online to support ROMP, support. Bookmark the permalink.